sairam ..Nice to read your messages ....Had been your great fan and you are such an ispiration to us . and prove oneself as good and pious in the eyes of others, one commits more sins and tells lies. becomes the prey of lots of worldly diseases and continuously remains in sins. Ego is the main hindrance in self-analysis and man-making, and with ego one ever acts as doer. one obtain humility in full. Then he is a conscious co-worker of the divine plan and takes Him as the Doer. The power of the spoken word is something never to be taken lightly. With one word, you have the power to encourage or discourage, to delight or disappoint, to lift up or tear down, to heal or hurt. It's essential, therefore, in both your personal life and your professional life, that you allow praise to be frequently found flowing from your lips. Use some of the following tips to give praise a priority in your day. 1. Do it now � don't wait for an "official" time for evaluation or feedback. Give praise as quickly as you discover a praiseworthy act. 2. Use various methods � give praise in person, in a note, at a meeting, in a newsletter, on e-mail, on the phone, on voicemail. Be creative! 3. Go public � when appropriate, praise in public so you "toot the horn" of the person being recognized. 4. Keep it simple � kind words are often the easiest � but often most over-looked form of praise. A kind word of acknowledgement, thanks or a greeting "Good Morning!" can be a form of praise that, while simple, can lift someone's spirits and lets that person know you're thinking of them. Look for opportunities every day to share a word of praise or kindness the impact can be powerful! What are the two great unfulfilled dreams of your life? Think about it for a minute. What legacy would you like to leave that you havenít fulfilled yet? Education, family, job, relationships, parenting, spiritual growth, health, recreation, hobby, finances - what do you dream of doing? You know, it's really never too late to do something positive about accomplishing your dreams. Walt Disney said, "If you can dream it, you can do it." He accomplished his biggest dreams when he was in his later years of life. So since we can't use the excuse of being too old to dream, let's try it. Write down on a 3" x 5"card what your two great unfulfilled dreams are. Then, commit your dreams to the litmus test - give them to God in prayer. Take your dreams and plans to God and let Him guide you in fulfilling them. He has promised that if we follow His commands and are certain to line up our lives with His will, He will give us the desires of our hearts. Keep your dreams on that 3" x 5" card and every morning commit them to God in prayer. Keep your life squarely in the center of God's commands and watch for how He will lead you. "For I know the plans I have for you," declares the Lord, "plans to prosper you and not to harm you, plans to give you hope and a future" He wants to fulfill your dreams, so why not let Him! There are two days in every week we should not worry about, two days that should be kept free from fear and apprehension. All the money in the world cannot bring back yesterday. We cannot undo a single act we performed. Nor can we erase a single word we've said - yesterday is gone. The other day we shouldn't worry about is tomorrow, with its impossible adversaries, its burden, its hopeful promise and poor performance. Tomorrow is beyond our control. Tomorrow's sun will rise either in splendor or behind a mask of clouds - but it will rise. And until it does, we have no stake in tomorrow, for it is yet unborn. It is not the experience of today that drives people mad - it is the remorse of bitterness for something that happened yesterday, and the dread of what tomorrow may bring. Let us, therefore, live one day at a time! and decorate your own soul instead of waiting for someone to bring you flowers. You are always nice to us Baba Sai! On this GuruPoornima day, humbly we offer our obeisance at thy Lotus Feet. Bless us with the choicest gifts from Your Treasure Box. Sri Hemadpant came to Shirdi on account of the stored merit of his Punyakarmas. You were standing in the corner of Sathe's wada. He ran, prostrated before you. Joy knew no bounds. He found more than what he had heard from Nana Chandorkar. All his senses were pacified and he forgot thirst and hunger. As he touched Your sacred feet, he began a new lease on life. You held his hand and never let go. Gaulibuva came for your Divya Darshan every year and testified with great faith that you are Pandharinath Vithal incarnate, the merciful Lord of the poor and the helpless. Sri Dasganu had a desire to visit holy Prayag You showed with mercy, Ganga and Yamuna flowing from Your Toes. Such is the significance of Your holy feet. That is where live all the Thirthas of your Bhaktas. You came to Shirdi as a young lad. Just like Krishna, children looked at You with awe and old ladies' hearts swelled up with motherly affection. At Your very first Darshan, Mahalspati heart cried out, YA SAI and You became our Sai. Bless us with the same wealth that You blessed your Mahalspati with. Saint Gangagir came to Shirdi & seeing you carrying pitchers of water in both hands for watering the garden was amazed at Your Darshan and said "Blessed is Shirdi that it got this precious Jewel; but He is not an ordinary fellow. As the land was lucky & meritorious, it secured this Jewell". Saint of Anandmath was lucky to find pure diamond like you. Such was the efficacy of Your Darshan that it quieted our Samsar. Mr. Cholkar's desires were fulfilled just by Your Darshan. Mr. Sathe resorted to Your feet and seeing Your form, which was like eternal Brahma, luminous, spotless and pure, his mind became calm and composed. Such was the efficacy of Your Darshan that Bhakta Pant saw his guru in You and was blessed with fearlessness. Ramdas Bhakta devotee saw her beloved Deity Rama in You.. Lala Lakhmichand was so happy to have Your Darshan that he was enrapt with Your Lotus Feet as a bee with a sweet smelling Rose. Kakaji Vaidya found that there was no benediction, no words, just Your Divya Darshan filled his whole being with peace. Darveshis came with their sick Tiger at Your door for You to cure him. Tiger's head hung down on account of luster on Your face. Such fortune to have death at Your Lotus Feet. Baba, On this GuruPoornima day, bless us with the Vision like you blessed Anandrao Pakhade. Let us decorate our Hridya simhasan with gold and diamonds of all Satwick vrittis. Reside our Deva, take Your Feet out of Your Kafni and let us change the directions of our lives towards the SatyaPath. Let us direct all our senses towards our eyes wherein live You my Sai., We have placed Your Padukas in our heart. Murmur with Your sweet voice, Your eternal message that "THESE ARE THE FEET OF THE LORD". Baba, instill Your Shashwat Sandesh in our ears, "OH.. WHAT IS THERE IN AKKALKOT, and WHAT IS THERE IN PRAYAG"? THE RANCHOD OF DWARKA IS IN SHIRDI. Come to our house for Bhiksha and let us serve You with our sweet devotion. Be pleased with it and placing Your VardaHasta on our heads, comfort us by saying, "THESE FEET ARE OLD AND HOLY, YOU ARE CAREFREE NOW. PLACE ENTIRE FAITH IN ME AND YOU WILL SOON GET YOUR OBJECT." The theory of relativity by Albert Einstein has revolutionized the way the universe around us is perceived. It is considered the greatest scientific discovery of all times that says that space and time, which form the basic fabric of our lives, are relative. For instance we can talk of time only relative to something else for e.g. a clock or by the span of sunlight or moonlight around us. Similarly space is consumed of objects from the tiniest to the largest. Space is talked about the same way in relation to some other space. The theory further derives that at greater speeds, which are not readily perceived by our sense matter or mass and energy interchange. Such is our universe that everything comes out of only one and is various manifestations of that source. What is that source continues to baffle even the greatest scientist. Whatever we express follows this law of relativity of nature and we define an object in some relation. It is how you describe the relation with that object that you perceive that object in that way. As it is said in Baba's arathi, as you approach Baba so do you experience Him. And how one approaches stems out of the relationship one defines. So also in perceiving Shri Sainath, it is how you describe the relation within yourselves with Him that defines how you will interact with Him. As one keeps experiencing Baba more then they are redefining their relationship too. That relationship could become stronger or weaker depending on our behavior and actions. A stronger relationship evolves into a deeper faith that could help one tide over the various facets of this life and beyond. In the final hour what matters is whom can one depend on for their future journey? That the soul is ever living and journeying has been emphasized repeatedly in all religions and by Baba himself when he tells Nana Chandorkar that He knew Nana since over 72 lives. So it is necessary not only to think just about this life but also the one beyond, the one which do not know and fear about to the extent that we don't want to talk about it. It is perfect masters like Shri Sainath who provide the comfort and direction to their devotees and believers. May Shri Sainath ever bless those whose faith in Him ever increases. is the first step to comprehending His enormous power. simplicity we flock to Him. 1 Sri Sai is Love - If you must be mad, be it not for the things of the world. Be mad with the love of Sri Sai… Many good sayings are to be found in holy books, but merely reading them will not make one religious. One must practice the virtues taught in such books in order to acquire love of Sri Sai. 2 Sri Sai is True Knowledge - If you first fortify yourself with the true knowledge of the Universal Self, and then live in the midst of wealth and worldliness, surely they will in no way affect you. When the divine vision is attained, all appear equal, and there remains no distinction of good and bad, or of high and low… Good and evil cannot bind him who has realized the oneness of nature and his own self with Brahman. 3 Sri Sai is in Your Heart - Because of the screen of illusion that shuts off God from human view, lotus of your heart, you must keep the lamp of remembering Sri Sai ever burning. While engaged in the affairs of the world, you should constantly turn your gaze inwards and see whether the lamp is burning or not. 4 Sri Sai is in All People - Sri Sai is in all men, but all men are not in Sri Sai, that is why we suffer. 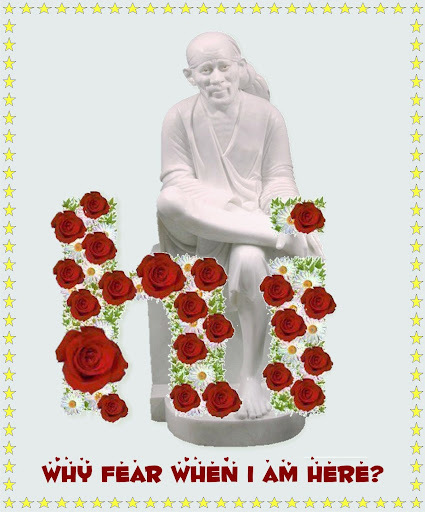 5 Sri Sai is Our Father - As a nurse in a wealthy family brings up her master's child, loving it as if it were her own, yet knowing well that she has no claim upon it, so you also think that you are but trustee and guardians of your children whose real father is Sri Sai Himself. 6 Sri Sai is Infinite - Many are the names of Sri Sai and infinite the forms through which He may be approached. 7 Sri Sai is Truth - Unless one always speaks the truth, one cannot find Sri Sai Who is the soul of truth. One must be very particular about telling the truth. Through truth one can realize Sri Sai. 8 Sri Sai is above all Arguments - If you desire to be pure, have firm faith, and slowly go on with your devotional practices without wasting your energy in useless scriptural discussions and arguments. Your little brain will otherwise be muddled. 10 Sri Sai is the End - To work without attachment is to work without the expectation of reward or fear of any punishment in this world or the next. Work so done is a means to the end, and Sri Sai is the end. Practice of casting and drawing chits in front of Baba? I think the act of casting and drawing chits in front of Sri Sai is just a way adopted by some devotees to satisfy themselves but on the other side its a wicked sign showing that we don't have total faith on Sri Sai that whatever Sri Sai will do will be for our own benefit. Sri Sai is Omniscient, Omnipotent and Omnipresent. We should have a steady faith towards Sri Sai and surrender all our karmas to him. There is no need to cast and draw chits; it's just to satisfy our mind, which is wandering around. DAYA KSHAMA KRIPA RAKSHA KARO SAI DEV!! Live Simply~Love Generously~ Care Deeply~ Speak Kindly. I beg to differ in this point of your view, I do understand when devotees (especially young ones or those who are introduced just recently have the practice of asking chits every now and them, ) when we are still matured by BABA's grace can understand his Omniscient, Omnipotent and Omnipresent but it is not doubting him or in shaken faith we draw chits. as SONKIA ji also points out this custom is prevailing since SAI's durbar, but should be used in real important decisions. At certain time constraints, for example we have seen a few houses for a rental accommodation, in this fast racing world people are ready with advance in cash / chq waiting in queue the time they come in for seeing the house, so if you dont be the first one in the race, you are the loser, on particular day we have seen 5 houses, 2 of them not suitable for some reasons, three are OK with respect price, locality, convienience etc., how will you know which one BABA is going to chose for you. We draw 4 chits in this case with each one with the address of each house and the fourth one saying that "none are suitable" the drawn chits either at POOJA MANDHIR at home or temple ( if nearby) if one of them with address is picked up we just bluntly abide by his decision, even if "none are suitable" is picked up we just abide by it and again start the hunt. Why is "none are suitable" written just when you write the three adresses you are forcing BABA to give one amongst that whatsoever, but BABA may feel that even all the three are not suitable for you. Hope in the process of this post i am not hurting any one's sentiments, pls aceept apologies if i am doing so, as far as we are concerned we regularly take decisions by asking BABA only, no decision is ours. We have personally experienced and i can narrate many leelas of his in way of giving us his decisions, when we have asked for his decision in early days, but felt we cant comply it and how we have suffered till we did comply to his decision and got his blessings theresfter. Page created in 0.408 seconds with 64 queries.